East Harlem (also coined as “Spanish Harlem” or “El Barrio”) is bordered by 110th Street (some say 96th Street) to the south, the Harlem River to the north, Fifth and Lenox Avenues to the west and the East River to the east. Regularly noted in pop culture by such icons as The Mamas and the Papas, Bob Dylan, Ben E. King, Elton John and Carlos Santana, the area has as mixed a population as those who made it famous. 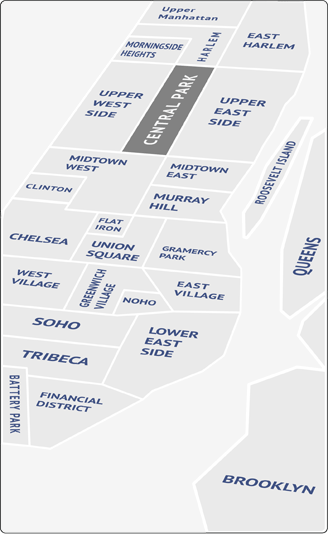 The southern tier of East Harlem, longtime gentrified having earned it nicknames, including "SpaHa", "Upper Upper East Side", and "Upper Yorkville”, is where young professionals have settled into recently constructed buildings. There are multitude of market-rate rentals, luxury condos and co-ops (in new, as well as converted buildings) between East 96th and East 97th and as the area has been improving its image, new developments have sprouted to higher streets. One can also still find tenement-type 4-6 story housing at more affordable prices. Creole, Caribbean, African, Cubano, and Latin America – it all can be found here. Try the old world Italian charm of Piatto D'Oro or maybe you will run into Martin Scorsese at Rao's Restaurant, who has been known to treat his editing crew to dinner there. The Harbor Conservatory for the Performing Arts, home to the Raices Latin Music Museum, a Smithsonian affiliate, serves as a focus for theatre, dance, and musical performance in the neighborhood. There is also the Jazz Museum of Harlem, another Smithsonian affiliate, El Museo del Barrio, a museum of Latin American and Caribbean art and culture and the Museum of the City of New York. The Museum for African Art will join these at Duke Ellington Circle. You can also have a drink while listening to country music at The Duck or dance salsa at the Milk Lounge.